Backup or the process of backing up refers to making copies of data so that these additional copies may be used to restore the original after a data loss event such as accidental ﬁle deletion, data damage or corruption. Imagine a disaster similar to the Christchurch earthquake or the Queensland Floods. The data on the server would be lost but so would the “backup” given that it resides in the same geographical location. Backing up to the “cloud” means that the data is safe in another secure location. In our opinion, this should be, without a doubt, standard policy for any business today “Disaster Recovery Plan“. How can we help you with backups? After signiﬁcant research, CFL is proud to announce an automatic online Internet backup service in conjunction with a proven solution provider. CFL will install a backup agent on your server or a workstation. This agent will then back up your VETLINKSQL data as well as any other data speciﬁed by you over your Internet connection to a secure Data centre. 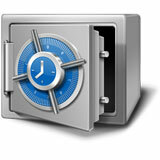 All backups are encrypted for security and compressed for transmission efﬁciency. The ﬁrst backup will be full and from there on each backup will be an incremental backup. Incremental backup is a process of backing up ﬁles and data that has changed since the last backup. An incremental backup is much smaller and quicker than a full backup. For instance, following a full backup on Friday, a Monday backup will contain only those ﬁles that have changed since Friday. A Tuesday backup will contain only those ﬁles that have changed since Monday, and so on. What are some of the advantages of online backups? How will you know that your backup was completed successfully? Once a backup has been completed successfully an email will be sent to a designated email address. This can be you (the end user) or for a small additional fee ($1 per day) it can be sent to CFL who can monitor backups for you and alert you if problems arise. 12 months minimum term. All prices exclude GST and any incurred expenses. Available on all Windows operating systems. In case of a data restore CFL’s standard hourly charge applies.